WiringPi supports a devLib extension to allow you to use the PiGlow add on board from Pimoroni. The devLib driver allows you to select the brightness of an individual LED, a “leg” or a “ring”. The clear parameter is TRUE or FALSE. If TRUE, then all the LEDs will be turned off to start with. This will light up all 3 LEDs on the given ring at the given intensity – 0 (off) to 255 (really bright!) The ring number is 0 from the outside to 5 for the inside. PIGLOW_RED, PIGLOW_YELLOW, PIGLOW_ORANGE, PIGLOW_GREEN, PIGLOW_BLUE or PIGLOW_WHITE. will light up the 3 orange LEDs with an intensity of 60. This lights up an individual LED to the intensity given. The leg and ring parameters specify the LED to set. Look in the wiringPi/examples/PiGlow directory for some example programs including a simple piglow utility. Compile these by typing make as usual. 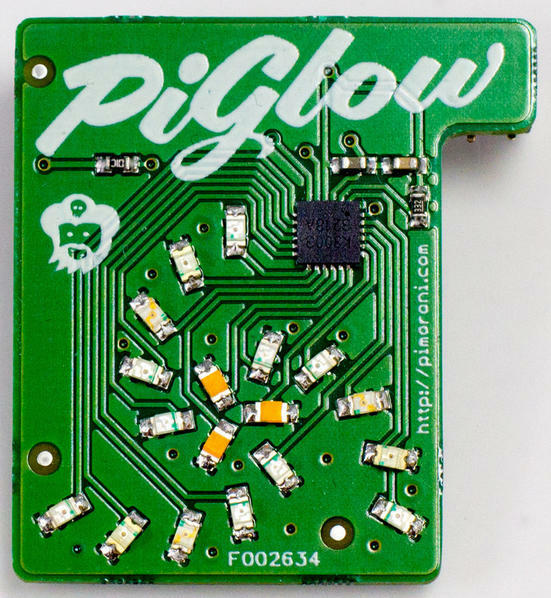 the piGlow1 program is the ones used in the video below. Use the i2cdetect program to scan your I2C bus to make sure the Pi can see the SN3218 which will show up as 0x54. The wiringPi SN3218 driver knows which revision Pi you have, so you know need to take any special precautions – your code will work on either a Revision 1 or 2 Pi. Internally the PiGlow devLib extension adds 18 more pins to wiringPi’s pin map. These pin are normally at location 577. This should not be an issue as the PiGlow is designed to be the only peripheral on the Pi, but if you have used a breakout board to add other devices to it, then you should pick a pinBase that’s outside the range 577 through 595.